Learning how to care for your home and your property by properly taking care of your septic system is a process that begins first with understanding how your septic system works. 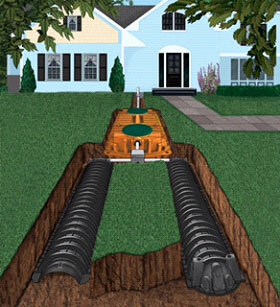 The main sewer line, which is also called the waste line, connects the home’s indoor plumbing system to the septic tank outside of the home. The septic tank is usually buried about 10 feet or so from the home’s foundation. This is where all forms of waste (both solid and liquid) are transferred and retained. 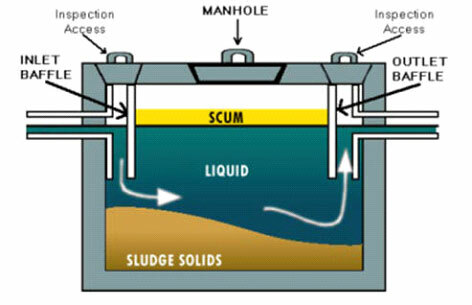 While the solids settle to the bottom of the tank as sludge, a floating scum and grease layer will form at the top of the tank. Traps called “baffles” prevent solids and floating scum from leaving the tank. Clarified liquid is then allowed to flow out of the tank into a soil absorption system. The effluent distribution pipe directs the flow of the liquid waste from the septic tank to the leaching system farther out into the yard. Distribution boxes are often present to help evenly distribute the flow throughout the system. A leaching system, or soil absorption system, is also sometimes called a drain field or leach field. This is a network of perforated pipes that extends into a specific area of the yard. These pipes are usually buried in gravel trenches and the effluent that flows out of them disperses into the surrounding natural soils. Have “risers” installed to make septic tank pumping and monitoring visits easier and less time-consuming. A “riser” also makes pumping and monitoring cause less mess and disruption in your yard. Routine maintenance can lengthen the life of your septic system. Contact a certified On-site System Maintainer (OSM) to inspect and monitor your system on a regular basis. The frequency of maintenance depends on the type of system, ranging from 3 months to 3 years. Gravity and Pump to Gravity system owners may inspect their own system, or hire a Pumper or OSM. Click here for more information. How often you pump depends on the amount of water use in your household or business. General rule of thumb: the more people using your septic system = increased water flow = your septic tank will fill up faster = more frequent pumping. Information about pumping your septic tank. Using less water may increase the life of your septic system. Using too much water is a frequent factor in failed systems. This is one of the easiest ways to be water wise. “Even apparently very slow leaks, such as a slowly dripping faucet, can generate 15 to 20 gallons (57 to 76 liters) of waste water per day. This includes diapers, cigarette butts, coffee grounds, sanitary napkins, tampons, condoms, grease, oils, unwanted medications or paper products other than toilet paper. Products labeled as “flushable” may not be suitable for a septic system. Large volumes of water can ‘drown’ your drain field and chlorine can destroy important bacteria in your septic tank and drain field. Drain hot tubs away from the system, especially the drain field. For disposal options, call Vac-Tec Septic & Water LLC. Tacoma – (253) 777-4887 Seattle – (206) 339-0039 Olympia – (360) 338-6686. Learn more easy-to-do tips about saving water in different parts of your house on the Washington Sea Grant Program’s website (for example, choosing laundry detergents and toilet papers, washing dishes, etc.). This additional water may prevent the drain field from working properly. Prevent costly future system problems by contacting a certified professional, such as an Installer, Designer, or qualified professional Engineer to repair your system.